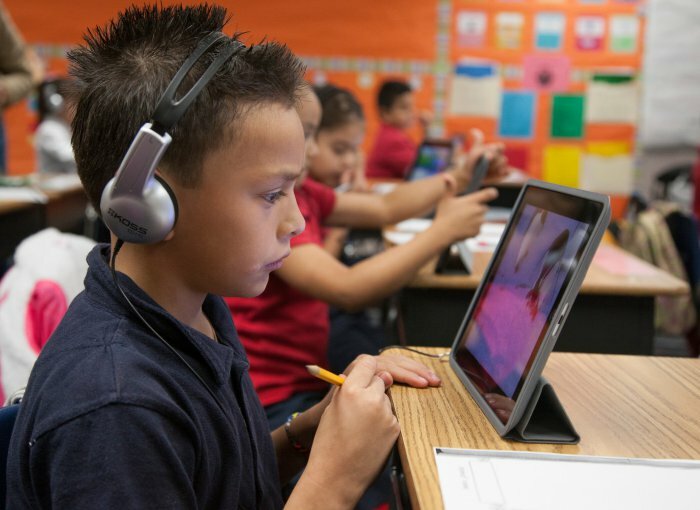 Mesa Public Schools is committed to student achievement through the use of technology in the classroom. Schools throughout the district benefit from the use of one-device-per-student initiatives. In August 2015, all students at Skyline High School were given the opportunity to use a district-issued laptop computer at school and at home. Students check out a Lenovo ThinkPad Yoga 11e device at the beginning of the year and return them at the end of the year. Students are able to use the laptops for work in class, homework and research. In January 2016, Westwood High School students joined the 1:1 initiative program, followed by Dobson and Red Mountain high schools in August 2016. Mesa and Mountain View high schools completed the rollout in August 2017. All students in secondary math classes are given the opportunity to use individual laptop computers during classroom time. At Eisenhower Center for Innovation, students also take part in a one-device-per-student program. At the school, students use individual iPads in the classroom. At Lehi Elementary, students use individual devices for ST math, Google Docs and Presentations, Microsoft PowerPoint and more. Elementary students in accelerated math classes experience a unique online learning experience through the district's vAcademy.